Sparked off by what you were saying about difficult records, I want to take one and play about with its significance for me. Dave Marsh is a great model: a thousand mini-essays in The Heart and Soul of Rock'n'RolI, no set pattern: three lines about a 45 or two pages; a wholly personal memory or a discussion of the recording date - no rules: it's whatever you want to say about a record, the only idea being it'll make people want to search it out - the whole point of this notice board, after all. Cause the record isn't just the record; it's you - your memories – the group then and now: "Cohesive," as Jake (or Zeke) said. And the song I want to talk about is ... Golden Teardrops. My major doowop thrill. Odd as it may seem, it wasn't that accessible to me when I first heard it. On a poor quality oldies compilation, c.1978, with muddy sound and a dubbed on guitar (Veejay version). Adjoining tracks, like Sonny Knight's Confidential or the Spaniels' Baby It's You, seemed far better: I got the point. But this - this was Ink Spots territory, wasn't it? That guitar. The Harptones' I Almost lost my mind, also on the LP, that was emotion; the Flamingos seemed out of reach, unfocused, somehow. I couldn't take the whole thing in on one listen. 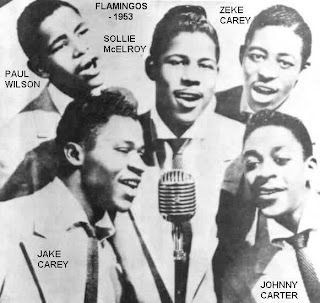 And if all this seems odd to Americans, remember I had a very limited frame of reference: doowop was the brightness of Frankie Lymon or (dare I say it?) the Diamonds' version of Little Darling. And it's what you were saying, Clarke, about not getting a record on first hearing. I don't particularly recall a moment of piercing clarity. But at some point the elements made sense - tremulous falsetto, out-of-tune-sounding yet absolutely right lead, odd lyrics (why "a cottage by the sea"?) and above all that sense at the beginning that we're being ushered into a holy place, cavernous and echoing as a great cathedral, and then drawn together in a moment of collective stillness, as though calmly taking stock of the sadness in things (Iacrimae rerum, appropriately enough: "the tears in things") before there's a collective sigh - at what life is?- and Sollie McElroy comes up to testify or confess: "Swear to God I'll stray no more ..."
But it's too late: although at one point he addresses the lost love directly - "Darling, put away your tears," – the burden (and howl) of the song is about regret: all he can do is try to take in fully the time he hurt her enough to make her cry: the time, now gone, when he mattered to someone, and the knowledge bearing down upon him that he's going to be carrying that memory to the grave and beyond: "Until the end of time, And throughout eternity - " Golden Teardrops. Cried, by her, for him. And the rest of the group, or congregation, seem to grab him there - we're almost at the end of the song now - try to hold him in that moment when he feels the enormity of what he's done. Maybe the wisdom will last. Who knows? But the sad, sweet pain - he was once loved - undoubtedly will, if the falsetto that weaves in and out of the reiteration of that painful vision of her tears at the end is anything to go by. I've said before that doowop lyrics don't matter that much: a peg for emotions. They'd be trite enough here if read on their own (Ditto Danny Boy.) But they give the group a clarity of focus that inspires them to a height they never quite attained on any other song, for me. If any of you reading this haven't heard Golden Teardrops, download a file, buy a CD (Rhino), do something. It is, quite simply, the loveliest and the saddest of all doowop records. In his autobiography Chaplin talks of the day music entered his soul, or words to that effect . Golden Teardrops, like Danny Boy, seeped into me on some unknown date. But I never tire of it and always hear it afresh; for me it holds the whole mystery of doowop: it's religious, it's secular, it's... beyond words, actually. So much for stopping... but I've needed to say all this for years. This can also be found near at the start of the blog as a taster for the Doo Wop Dialog[ue] posts; click on that version, posted under the song's title, for all manner of diversions and discoveries which came to me as I wrote, thought and surfed for images. See also post 32 of the Dialog[ue] for a comparison of the original and overdubbed versions. SPOILER ALERT: the original wins. Who could have seen that coming, eh? As so often, the image above has been borrowed from Unca Marvy.